The new Rapid Intake mLearning studio looks like it's on its way to become a great authoring tool for all of us who are into ubiquitous learning. 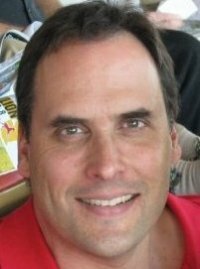 Last Friday I had the pleasure of talking to David Blakely from Rapid Intake solutions. Rapid Intake is company that thrives on its dynamic developers and it shows. They have focused their recent energy on coming up with an authoring tool that allows instructional designers to deliver content across multiple devices while keeping the same content logic, though formatting the content towards the device that is connecting to that content. You can follow them on twitter via @rapidintake. 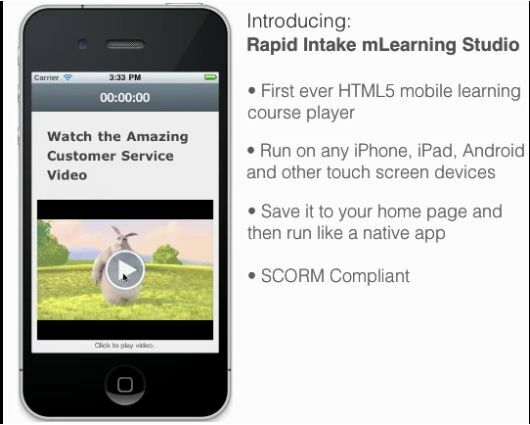 For those of you who want to take a look at the Rapid Intake mLearning studio, or Rapid Mobile, feel free to take a look at a course example and how it tailors itself to the device that is connecting to it. You can ask for a demo, or get on their mLearning mailing list, so you will be the first to know when they launch this html5/flash authoring tool to the big public! The tool uses html5 whenever a mobile device connects to the content. They are testing it on android2.2 (galaxy tab, smartphones), iPad and iPhone, and a blackberry version will follow at a later stage. The great thing about this authoring tool is that the developer only has to author one time, once the learners uses the course the device will get the output that fits its specifics. The learners on desktops will see the application in flash, the others on html5. The tool also allows a lot of personalization, which is great for designers. Additionally, it is scorm comformant, so you can bookmark, which makes it ideal for ubiquitous learning as it memorises where you - as a learner - where looking at the content, so if afterwards you connect to it with another device, it immediately recalls what you have seen and which answers you gave. You can also deliver it to any scorm LMS. Although the tool will only be launched in March 2011, I had the pleasure of playing around with it (desktop, iPhone and Android running 2.3). Swiping moves the learner from page to page and it works smoothly. At this point in time they have only enabled a couple of templates (text, video, picture and a couple of quizes), but it looks great already. Possibility to add a page narration as well, which is nice. The example course ran smoothly and wonderfully on my desktop, iPad and iPhone, but it was not completely running as it should on my Android phone. Nevertheless, they still have 2 months to get everything up to speed and ... it is really worth a look. This tool will save me a lot of developing time, so yes, I will keep an eye out for when it launches in March. 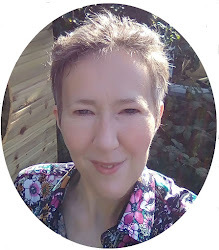 This week was rather busy, developing an online mobile course that will be open to all, following LAK the open course on learning analytics and finalizing a needs assessment, on top of regular work. But! The LAK content keeps intriguing. This week's content focused on the semantic web, linked data and intelligent curriculum. The topic that struck me the most in this weeks LAK-topic was the idea of an intelligent curriculum. Just imagine that all the data that you - as a learner or knowledge worker - go to, examine, read, ... are analyzed and put against the content of the rest of the Web? And just think that an algorithm is put upon that data to see which content might be of use to you, but really of use to you... that would certainly enhance in-depth learning in your field of preference. So the screening of data would result in immediate relevant content (which affects what needs to be learned, as old/new knowledge can change rapidly). Professional learners will be able to get to relevant up-to-date information much quicker. The benefits for learning are enormous: it would not only provide me with personalized, tailored content that fits my current hunger for knowledge, it would also allow me to stay in close contact with those who provide that information and share it amongst those who have a similar interest (if an algorithm would keep track of who has similar interests, or who is close to the content I go to). This would have an effect on my (and others) professional networks, for the professional groups will shift from a more localized network to real global networks that learn through connectivity (well, most of us do this already, but professional groups that link up will become more important and most of all attainable). We - as educators or trainers - might even be in the possibility of creating a course which redesigns itself depending on the prerequisites and skills of a particular learner, thus giving her/him a much smoother learning path, without leaving the learning objective itself. This approach of semantic learning might even take us out of the artificially divided classrooms. If we could cater lessons to a variety of learners, they would not be put into classes depending their age, but depending their ability to grasp what is necessary, or depending on their eagerness into specific subject matter. It will also facilitate research: just imagine, that you want to launch a new project in your scientific field? You need to write a proposal, and with an algorithm (AI friend) which searches in your scientific field (e.g.) scholar.google and cross-references this to the data bank of EU/WHO or B.& B. Gates foundation for funding that was granted... you could be on your way to get a funded post-doctorate or project going with much more ease. Bert who works at IBM and comes up with great learning strategies and educational games, launched an interesting concept which fits learning analytics. This is what he proposed to enhance learning performance: OK, I'll try one again. Does anyone else feel comfortable adding some use cases as we go along in this course? A young manager quarterly runs a tool to picture his social network, as part of his continuous leadership development. 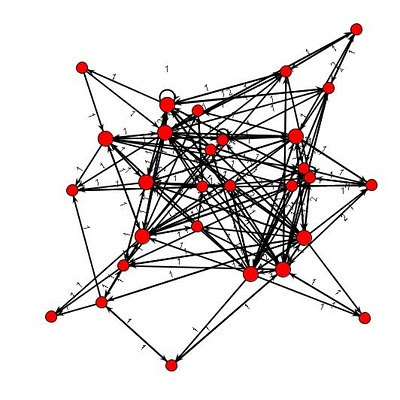 Data mining has shown that successful leaders in his corporation typically have 1/3 of their network amongst subordinates, 1/3 with other managers on the same level, and 1/3 higher up the chain. The tool allows the young manager to see the evolution in his network and get some action points to move it to the desired state. The semantic web is growing, and it effects all of us who search for content or other things in the vast amount of digital data that is on the web. As the web will become more semantic, all the data that is on it will be tagged, linked, analyzed... and this should increase our feeling of the 'living web'. Which ties the semantic web into Artificial Intelligence (AI) nicely. For those interested of hearing more on semantic technologies in learning environments, have a look at the video lecture given by Dragan Gasevic available at http://bit.ly/gfXqEF (cool guy). Many of us use learning management systems, and some of us even track students to support learning processes, but let's face it: tracking does not always result in clear visualization of the interactivity that is taken place amongst learners. Here is where SNAPP comes in. There are other visual analyzing tools, but SNAPP is simple to use and easy to install, which is why I really like it. SNAPP is developed by the University of Wollongong (who I think are coming up with a great deal of interesting educational innovations and thoughts). SNAPP allows you to transcript interactions in Moodle, Blackboard (and webCT, Desire2Learn into maps that immediately show who is a hyperconnected learner or participant, and who is more of a lurker, or even to pinpoint learners that at the core of the interactions. SNAPP is a software tool that allows users to visualize the network of interactions resulting from discussion forum posts and replies. The network visualisations of forum interactions provide an opportunity for teachers to rapidly identify patterns of user behaviour – at any stage of course progression. SNAPP has been developed to extract all user interactions from various commercial and open source learning management systems (LMS) such as BlackBoard (including the former WebCT), and Moodle. SNAPP is compatible for both Mac and PC users and operates in Internet Explorer, Firefox and Safari. By mapping interactions, you have a better overview of what people are doing and how they learn/perform. As such I see two fields of interest: education/training and knowledge management in corporations. * allow your students to benchmark their performance without the need for marking. SNAPP also allows you to pinpoint lurkers (who might be a good target audience for research, e.g. did they get something out of the course, and why did they only lurk? Additionally, you can filter out those students that might be good future facilitators. For students that are in the middle of the interactions, are clearly motivated and strong in reaching out and communicating. Another educational benefit is for looking at peer-2-peer interactions. It might be that you do not get much feedback from a student, but after analyzing the interactions, you might see that that same student is a real peer-2-peer knowledge node, and as such has great course value. This SNAPP approach can also be used for knowledge management. Let's say you have a internal, central 'help' forum inside your company. And there is a person responsible for giving help on that forum. It might well be that after you screen the forum with SNAPP, you can see that someone else in your organization offers just as much help or support, just because they know the subject. As such you can give a bonus, or a different function to that active employee and stimulate knowledge transfer in your organization. SNAPP does not simply provide the software, they also give an overview of how to interpret the visual data that you get from analyzing the network interactions. You download SNAPP and you get cracking with it! Visit a Forum in Moodle. Ensure that “Display replies in nested format” is selected. Click on the SNAPP Bookmarklet (from where you placed it in the Bookmarks menu in Firefox or the Favorites menu in IE). You may need to enable the Menu bar in IE 7, to view the Favorites menu. The SNAPP interface will be inserted at the bottom of the page. The SNAPP interface consists of five tabs: Visualization, Statistics, Export, Help and Credits. Within the Export tab, social graph data can be saved as GraphML or to the .vna format. The .vna format can be opened in NetDraw for additional analysis and visualization. What will you see on your screen: the program will go through all the threads, one-by-one (you see the screen flip from one thread to another), and eventually a Java-icon will be displayed. You just wait and the graphic will appear, together with 5 tabs. Netdraw - also a free tool developed by Steve Borgatti a nice bearded bowling professor in Kentucky, allows you to fine-tune the graphs you get with SNAPP. The picture depicted here is a representation of a welcoming forum in Moodle. CCK11 #Connectivism and Connected #Knowledge, join it starts today! George Siemens and Stephen Downes go at it again. If you have never followed the course (or if you are in for an additional treat, join the 2011 course today! It is a free and online course, open to everybody. 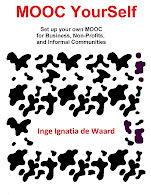 (from their site) Connectivism and Connective Knowledge is an open online course that over 12 weeks explores the concepts of connectivism and connective knowledge and explore their application as a framework for theories of teaching and learning. Participation is open to everyone and there are no fees or subscriptions required. The course will outline a connectivist understanding of educational systems of the future. It will help participants make sense of the transformative impact of technology in teaching and learning over the last decade. The voices calling for reform do so from many perspectives, with some suggesting 'new learners' require different learning models, others suggesting reform is needed due to globalization and increased competition, and still others suggesting technology is the salvation for the shortfalls evident in the system today. While each of these views tell us about the need for change, they overlook the primary reasons why change is required. For a quick introduction to connectivist courses and how they work, please view the videos below. Grasping all the factors of learning analytics is at the core of LAK11 course. In the first week John Fritz took the mic of the Elluminate session (you can see the recording here) and got all the LAK11 participants introduced to learning analythics. In order for learning analytics to take off, strategies must be in place that clearly recommend teacher or trainer interventions to pick-up those learners who are at risk of dropping out of courses or trainings. While listening to his presentation, I immediately got the idea that the mere fact of learning analytics is interdisciplinary. You cannot analyze learner metrics and hope to take educational action, if the educational intervention team is not connecting different fields together. John mentioned in this presentation that the biggest question for learning analytics is: how do we move on, where do we go from here? John mentioned that most educational and training institutes are still at the analysis stage, but they do not move on to an intervention stage to get their learners on track. I think this is part of the fact that within institutions interdisciplinary teams are scarce. Learning analytics demands more than the data, it demands true understanding of learning theories, of sociology, of instructional design, of psychology, IT (if not more). So if an institute wants to cross the barrier of mere analyzing their students, they will have to build a framework, or at least see if framework builders are willing to work together in their institutes. Is there such a thing as zone of proximal development for researcher teams? I feel that if a new research that expands across many fields of interest has any chance of succeeding, it must connect experts from all of these fields. That is easier said then done, as the diversity of fields might put the experts so far away, that there is no common ground on which to stand and understand themselves. So, getting together a mix of disciplines is not enough. In a way all of these experts must be within their own zones of proximal development, their knowledge must be close enough to be able to link to the newly to construct knowledge in an understandable way. If an interdisciplinary task-force to work on learning analytics and its strategies needs to be put together, I think the profiles of this team must be overlapping just enough to allow cross-understanding. John also talked about giving the learners the tools to adjust their learning. This is a huge meta-learning challenge, for it demands that learners understand many of the factors that influence their learning, which seems difficult to me. Nevertheless, what John says about this is interesting. It might help some students, but at the same time I feel that if even the researchers do not come up with strong solutions, how can we put most of the burden on the learners? (but I do agree with John that learners must also take responsibility for their learning). John mentions a great resource for research on self-regulated learning: Zimmerman. Conferences are always a great way to learn, but sometimes the ideas and knowledge gathered there stays located to the participants. To try and get some of the knowledge on mobile learning out to all of us, I recorded some small videos with my mobile device. I asked 8 people to give me feedback, but due to the quality of the recordings only 5 were editable. In this video you will see Herman Van der Merwe (Dean of the North West University in South Africa), Agnes Kukulska-Hulme (from the Open University in the UK, and currently IAmLearn president), John Traxler (Director of the Learning Lab and Professor of Mobile Learning at the University of Wolverhampton), Riitta Vanska (senior manager at Nokia), and David Metcalf (Institute for Simulation and Training University of Central Florida), they give their view on mobile priority research topics. 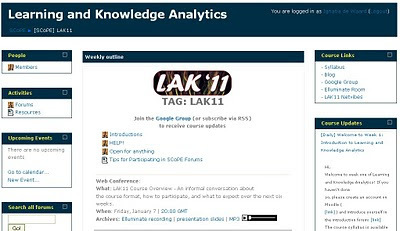 #LAK11 a free and open #elearning course on #statistics starts today, join! The open learning platform SCoPe is starting a Massive Online Course (MOOC) on Learning & Knowledge Analytics 2011 – LAK11 – is an open course that will be offered from January 10 – February 20, 2011. LAK11 serves as an introduction to the growing field of analytics in teaching, learning, training, development, and organizational knowledge. We will be using Moodle for course discussions. However, feel free to blog or participate in any forum you prefer. If you intend to blog, please send me (gsiemens (at) gmail.com) a link to your blog so I can include it in our aggregated blog list. 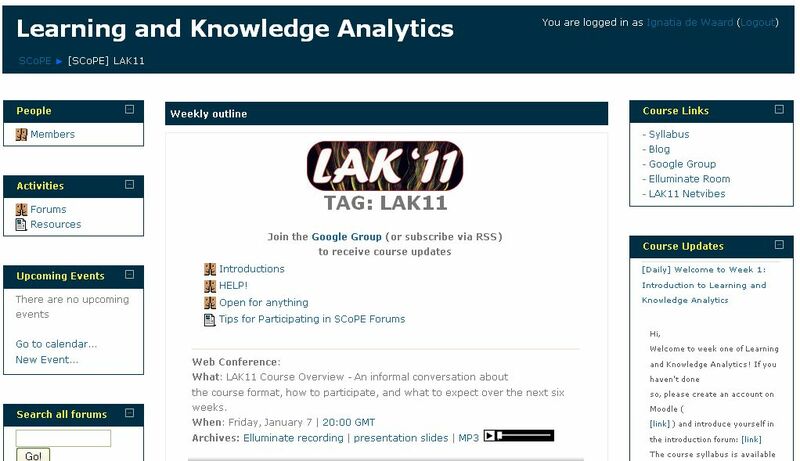 Blogs, Moodle posts, tags, and related resources will be aggregated in the LAK11 Netvibes page. Blooms taxonomy for a digital world: an overview of how you can fit new media into Blooms taxonomy. How to add a retweet and facebook button to your blog. What to take into account when choosing a mobile phone. Sumo paint, the free alternative for Photoshop. 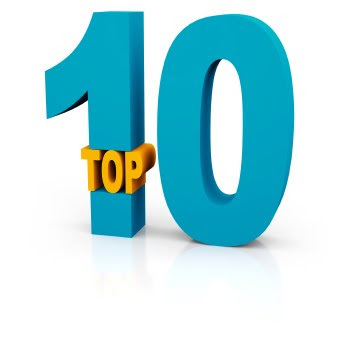 My top 10 learning tools for 2010. The Horizon report 2010: this report gives an overview of emerging learning technologies. The 2011 one will be coming out soon! Plenk: my vision of the educational future: yes augmented reality is mentioned. And the absolute top post was on the joint Mobile Moodle for iPhone project that we started in 2010 together with a wide variety of Moodle'rs. But, as you could read earlier this week: moodle is going mobile for a much wider variety of mobile devices. I will keep you posted. The Advanced Distributed Learning (ADL) people have just launched two brand new initiatives that anyone can join and take part in. The great thing about the ADL approach is that it is all about durability and scalability (yes, I like that!). With the start of a new age, the ADL consortium kicks of the quest for a new, contemporary SCORM and pedagogy for the future of learning. This is a great initiative and you, me, all of us are invited to draw our educational future. SCORM has been around for 10 years! Ten years?! Just imagine how the world has changed from a 'yes, a LMS is wonderful, and switching content around various LMS's rules!' to "Nah, just learn through connectivity, why use LMS or scorm?'. I am not a great fan of LMS, but I do feel that standards in learning materials still have a big potential. As such I am all into this new SCORM initiative! The Tin Can Twitter account. 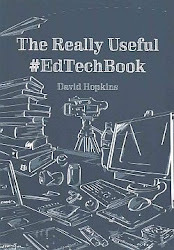 This is my cup of tea: pedagogy meets technology, #yam! The Future Learning Experience project returns ADL to its roots in Applied Research & Development. We envision this effort will contain several sub-projects aimed at providing learning solutions for DoD stakeholders. Future Learning Experience projects, regardless of what they specifically enable, will follow similar design and development patterns that include a transition phase to shift pedagogy, technology, best collected practices, policy and procedures to the DoD, government, academia and industry. The exchange of knowledge happens via online chats and meetings of which three will be occurring in January 2011:Thursday, January 13, 11:30am ET & 8:30pm ET, a #lrnchat will be focused on working with learning technology standards. #lrnchat is an online chat over the social messaging service Twitter that happens twice every Thursday, due to its popularity in the US and overseas. Follow @lrnchat for more information. the ADL team. Follow @lrnEXP for details. And thank you to ADL's almighty Aaron Silvers for getting me up to date! It has been quite a year for mobile devices! So many initiatives, so many actions. If all goes well, moodle will be made fully mobile, thanks to the group around Maria Jose Casany, Marc Alier (Ludo) and Jordi Piguillem who are connected to Universitat Polytécnica de Catalunya and the Grual Research group at Universidad de Salamanca (Spain). They have been working on Moodbile, which is a code project that will result in a GNU General Public License. Here you will find the latest activities on the Moodbile site. Stretch your fingers, speed up your word-processor and get typing for the extended deadline: 26 January 2011 to submit a paper/poster/panel... for the IADIS mobile learning conference that will take place on 10 - 12 March 2011. Early research in the design of mobile technologies for lifelong learning (Sharples, 2000) pointed to highly portable, individual, unobtrusive, available anywhere, adaptable to the learner's development, persistent, useful for everyday needs, and intuitive personal tools. Technological advancements have delivered mobile devices and applications which meet and surpassed early requirements and which have position mobile technologies as an essential part of the new ecology for lifelong learning. European Commission (2002). European Report on Quality Indicators of Lifelong Learning. Brussels: European Commission. Fischer, G. (2001) Lifelong Learning and its support with new media. International Encyclopedia of Social and Behavioral Sciences, Discipline “Cognitive Psychology and Cognitive Science”, Section Editor: W. Kintsch, Contribution No 41. Fischer G. & Sugimoto M. (2006) Supporting self-directed learners and learning communities with sociotechnical environments. International Journal of Research and Practice in Technology Enhanced Learning (RPTEL) 1, 31–64. Sharples, M. (2000) The design of personal mobile technologies for lifelong learning. Computers & Education 34, 177 – 193. Doctoral Consortium - The Doctoral Consortium will discuss on going work of PhD students in an informal and formative atmosphere. Contributions to the consortium should take the form of either: a critical literature review of the research topic providing the rationale for the relevance and interest of the research topic; or a short paper discussing the research question(s), research objectives, research methodology and work done so far. Doctoral Consortium Contributions should have a maximum 2,500 words (4 pages). For further details please contact the publicity chair - secretariat@mlearning-conf.org.